A 'little world' eating ocean garbage might be a mixed blessing. Specialist bacteria seem to be eating the plastic garbage we throw into the ocean. But whether they're cleaning up our poisons or just passing them back up the food chain remains to be seen. The ocean contains vast amounts of plastic, mostly as tiny shards floating just beneath the surface. Under an electron microscope, each scrap of "plastic confetti" becomes "an oasis, a reef of biological activity," says marine microbiologist Tracy Mincer of the Woods Hole Oceanographic Institution in Massachusetts. Mincer and his colleagues examined bits of fishing line, a plastic bag and a plastic nurdle (a pre-production plastic pellet) fished out of the Sargasso Sea, an area of the North Atlantic where currents cause debris to accumulate. The region as a whole contains more than 1,100 tonnes of plastic1. 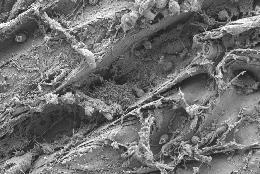 Scanning electron microscopy revealed bacteria-like cells living in pits in the plastic, as if they were eating the surface away. "They look like you took a hot barbecue briquette and threw it into snow," says Mincer. "You see this melting bit all around the outside of the cells, and they're just burrowing into the plastic." Microbes have been found digesting plastic in landfills, he says, but this is the first evidence of marine bacteria breaking down plastic in the ocean. The work was presented the 5th International Marine Debris Conference in Honolulu, Hawaii, on 24 and 25 March. Plastic-eating bacteria might help explain why the amount of debris in the ocean has levelled off, despite continued pollution. But researchers don't yet know whether the digestion produces harmless by-products, or whether it might introduce toxins into the food chain. "To understand if it's a good thing or not, we have to understand the entire system," says Mincer. Plastics contain toxins such as phthalates, and also absorb additional toxic chemicals such as persistent organic pollutants from the ocean, says Mark Browne, an ecologist at University College Dublin in Ireland, who was not involved with the project. Those chemicals could leach out into the microscopic animals that eat the bacteria, or broken down microscopic plastic particles could enter cells and release their chemicals there, he says. "Whether or not that material then passes up the food chain is something of critical importance," he says. "It's yet another mechanism for the particles of plastic that we throw away to potentially come back to haunt us." Genetic analysis shows that the bacteria on the plastic differ from those in the surrounding seawater or on nearby seaweed, says microbiologist Linda Amaral-Zettler of the Marine Biological Laboratory, Woods Hole. So far, the DNA sequences obtained by her lab show that almost 25% of the bacteria on one polyethylene surface were vibrios, bacteria from the same group as the cholera bacterium. "That was a surprise, because normally in sea water they would be present in much lower concentrations," says Amaral-Zettler, who adds that she can't yet tell if these strains are pathogenic. Wind and ocean currents carry plastic all over the world, so no part of the sea will escape the effects of this bacterial activity. Amaral-Zettler and Mincer also found genetic and microscope evidence of eukaryotes — organisms with more complicated cells than bacteria — on the plastic. What she calls the "plastisphere" might contain complex living communities. "It may be a little world that we've created, for better or worse." The Wood's Hole scientists aim to sample more ocean plastic and to isolate, culture and identify the microbes found on it. Then they can determine if and how they're digesting the plastic and discover what the by-products are. Individuals that physically interact with their outdoors tend to be passionate about preserving it. Hikers, conservationists, fishermen, hunters, rock climbers, and surfers are passionate about keeping their outdoor playgrounds free of pollution. One dedicated surfer has come up with a business plan to build surfboards from ocean garbage. Kevin Cunningham surfer and founder of Spiare Surfboards was so distressed about the ocean garbage he kept running into that he decided to do something creative about it. As Kevin likes to put it, “It is a dichotomy between the natural and unnatural. Natural materials form my surfboards; conversely, fragments of man-made debris such as plastic and glass are recycled and reused in the skin of the surfboard. Plastic bags woven into a strengthening cloth, plastic bottles cut up and reassembled into fins, and many other possibilities to be explored. ” His plans are initially to produce 100 hand made custom boards with ocean garbage, and if all goes well with the first 100, he plans on seeking outside financing to create an eco-conscious surfboard company using ocean garbage for his boards. Kevin even points out that if his board’s break they can be re-recycled into building materials. Kevin should not have a problem getting raw materials for his boards, as the oceans are full of trash. Hopefully, he will be able to help in cleaning them up! A special thanks to Kevin for supplying us with the video. In 1941, imagining the world that plastic would make possible, a pair of British chemists wrote of "a world of color and right shining surfaces...a world in which man, like a magician, makes what he wants for almost every need." Plastic has indeed completely transformed our lives—everything from modern medicine to food safety has been made possible by its fantastic and varied properties. But we've gradually realized that plastic has a dark side. It leaches chemicals that have been found in our bloodstreams and may cause permanent damage to us and our children, at the same time that it accrues in the oceans with no sign of breaking down. In Plastic: A Toxic Love Story (Houghton Mifflin Harcourt, April 18, $27), writer Susan Freinkel explores the tales of eight plastic objects—the comb, the chair, the Frisbee, the IV bag, the Bic lighter, the grocery bag, the soda bottle, and the credit card—to explore how plastic's fate became so entwined with our own. By turns whimsical and profoundly disturbing, Plastic gives a lucid, comprehensive, and, ultimately, galvanizing account of our past with plastic and what our future may be. I asked Freinkel about plastic's origins, its dangers, and what we can do to turn this love affair around. When the first plastic, celluloid, was developed, it was a solution to a pressing environmental problem: the hunting of elephants to extinction for ivory. What led up to celluloid's development, and what was the contemporary response to plastic? For most of human history people fashioned the things they wanted and needed from materials of the natural world. But by the mid-19th century, they were starting to recognize the limits of nature's bounty and the physical limitations of natural materials. Those fears about an impending ivory shortage led a New York billiards supplier in 1863 to run an ad offering $10,000 in gold to anyone who could come up with a suitable alternative. Eventually, this led to the invention of celluloid, which is considered a semi-synthetic because it starts with cellulose derived from plants. People loved it; it was now possible to mass-produce all kinds of consumer goods far more cheaply. An ivory comb would have been beyond the reach of the average shop girl, but she could certainly afford a beautiful faux-ivory one made of celluloid. Indeed, people continued to be enthralled with plastics for decades. Plastics promised abundance on the cheap. Health concerns about plastic arise from a series of discoveries that have made clear plastics are not the inert, stable substances we once thought. It began in the 1970s with a pair of revelations: one, that vinyl readily leached phthalates, chemicals used to make the plastic soft and flexible, and two, that many people had traces of phthalate in their bloodstreams, thanks to casual contact with various everyday plastic things from cars to toys to wallpaper. Writing about one of the reports, a Washington Post reporter observed, "human are just a little plastic now." What that meant was not totally clear: At the time, experts concluded that it didn't mean much because the amounts that leached out and got into people's bodies were so minute. Japanese scientist Hideshige Takada added another reason to worry when he reported that these tiny bits of plastic sop up persistent pollutants such as PCBs that are already present in the ocean. But new findings since the 1990s have made researchers rethink the risks. Animal studies showed that some chemicals in plastics, notably phthalates and Bisphenol A, can mimic and disrupt hormones, with profound long-term effects if the animal was exposed during critical periods of development—in utero, in infancy, or even different points during childhood. Then being even a little bit plastic could potentially have a big effect. Around the same time the Centers for Disease Control developed new, far more sensitive methods of measuring people's exposure to chemicals, and began producing biomonitoring studies showing that most Americans showed traces of phthalates, Bisphenol A, and other chemicals commonly used in plastics in their blood, urine, and other bodily fluids. Finally a variety of epidemiological studies have found associations between exposures to these chemicals and various health conditions, such as diabetes, obesity, infertility, asthma, and even Attention Deficit Disorder. All the dots haven't been connected by any means, but their presence on the public health map has ratcheted up concerns. Awareness of plastic pollution is also fairly recent. Although there have been scattered reports about plastic trash in the ocean going back to the 1960s, two recent developments sparked a new sense of urgency. In 1997, a sailor named Charles Moore took his boat through a rarely traveled area of the Pacific Ocean where converging ocean currents cause debris from Asia and North America to accumulate. Moore was shocked to see a steady stream of plastic debris float by day after day, which became known as the "garbage patch." And if anything testifies to the long and devastating reach of our throwaway culture, it's the presence of things like disposable lighters or toothbrushes or water bottles in the remote stretches of the ocean. Another landmark was a 2004 study by English scientist Richard Thompson showing an exponential increase over the past several decades in the amount of tiny plastic fibers and fragments in the North Sea. This "microdebris" is what's left after waves and the sun have broken up bigger pieces of plastic trash. Until then people's idea of plastic pollution in the ocean was focused on the big stuff, like six-pack rings or drift nets and the ways those could threaten wildlife. Thompson's work drew attention to these tiny plastic bits, which, it turns out, are suffused throughout all the world's oceans and can never be cleaned up. Meanwhile, Japanese scientist Hideshige Takada added another reason to worry when he reported that these tiny bits sop up persistent pollutants such as PCBs that are already present in the ocean. If fish and other marine animals eat these plastic fragments, as it appears they do, is there risk these toxic chemicals could work their way up the food chain, back to us? The people who know intimately about the dangers of plastic—the nurses in the neonatal ward, the researchers who study leaching—what do they do to protect themselves from it? The one measure everyone recommends is not to cook or microwave food in plastic since that can accelerate the leaching process. Some are cautious about storing leftovers in plastic containers and some only use metal water bottles—or at least take that precaution with their children. Most are careful about not eating too many canned foods, since the lining of cans often contains Bisphenol A. (Indeed, a recent study showed eating fresh fruits and vegetables for just three days could lower people's BPA levels.) Those with kids look for toys and products that are free of phthalates or BPA. But given the current framework of laws and policies regulating chemicals in the U.S. and the utter ubiquity of plastics, there's only so much an individual can do. U.S. law tends to treat chemicals as safe until proven otherwise. As a result, most of the tens of thousands of chemicals in commerce have been poorly tested to determine their effects on the environment or human health. In Europe, by contrast, the burden of proof is on safety rather than danger. European regulators act on the precautionary principle, the idea of preventing harm before it happens, even in the face of scientific uncertainty. A new E.U. law enacted in 2007 requires testing of newly introduced chemicals, as well as those already in heavy use, with the burden on manufacturers to demonstrate they can be used safely. To comply with that law, American manufacturers are already selling products in European markets that have been reformulated to comply with the precautionary principle. For instance, a phthalate alternative, DINCH, is being used in vinyl medial supplies sold in Europe. But not here. When you say our love affair with plastic needs couples therapy, you've nailed the difficulty of the transition we need to make. What kind of change is possible, in terms of regulation? And what kind of reasoned, thoughtful action can an individual take that will actually make a difference? Making over our relationship with plastic requires change at all levels—from government, industry, and individuals. I don't discount the value of what individuals can do. If we all made more of an effort to reduce our reliance on throwaway plastics (e.g., carry your own bag and bottle), to reuse more of the plastics that come through our lives, and to recycle as much as possible, that would help put a dent in plastic waste and pollution. We also can use our power as consumers to help shape the choices we are offered, making more conscious choices at the store and rejecting over-packaged goods and products that can't be reused or recycled. The power of the purse is why Walmart, Target, and other big box stores stopped selling baby bottles that contained Bisphenol A, even though the chemical has not been outlawed. We can also join forces in political campaigns to press for change. Pressure by the grassroots group Healthcare Without Harm helped persuade many of the country biggest hospital chains and hospital supply purchasers to stop using medical devices made of vinyl. But individual actions alone are unlikely to bring about the scale of change that we need. The European experience suggests that laws that hold industry accountable for the products it puts into the marketplace can have a powerful effect. The E.U. 's tougher chemical laws have galvanized greater use of "green" chemicals. I'm also impressed by the effect of Europe's extended producer responsibility laws—measures that make companies responsible for what happens to their products and packaging at the end of their useful lives. When companies, rather than taxpayers, have to pay for collecting and disposing of plastic waste, dramatic changes happen: They use less packaging, they use materials that are easily recycled, and overall recycling rates go up. These are the kinds of policies that could take us to a new level in our relationship with plastics, so we can reap the benefits plastics have to offer without the dangers. Nearly 3 billion pounds of chicken feathers are plucked each year in the United States -- and most end up in the trash. Now, a new method of processing those feathers could create better types of environmentally-friendly plastics. "Chicken feathers are one of those materials that is still basically waste," said Yiqi Yang, a researcher at the University of Nebraska-Lincoln and one of the authors of the new research. Feathers are mostly made of keratin, the protein that's responsible for the strength of wool, hair, fingernails, and hooves, he added. So they "should be useful as a material." Past efforts to create plastic from feathers resulted in products that didn’t hold up mechanically or weren't completely water-resistant, said Yang’s University of Nebraska colleague Narenda Reddy, who also worked on the project. To make the new plastic, the researchers started with chicken and turkey feathers that had been cleaned and pulverized into a fine dust. They then added chemicals that made the keratin molecules join together to form long chains -- a process called polymerization. The team presented their work March 24 at a meeting of the American Chemical Society in Anaheim, California. The plastic they made was stronger than similar materials made from starch or soy proteins, and it stood up to water. Moreover, high temperature treatment of the feathers at the start of the process would blast out any possible contamination, such as from bird flu, according to Reddy. The new material is a thermoplastic. "We can use heat and melt it to make different products," said Reddy. Heating it to a modest -- for industrial manufacturing -- 170 degrees Celsius allows the plastic to be molded into some desired shape, and it can be melted and remolded many times. Unlike most thermoplastics, which are petroleum-based, chicken-feather plastic uses no fossil fuels, the researchers said. The feather-based plastic could be used for all kinds of products, from plastic cups and plates to furniture. In addition to making use of feathers that would otherwise end up in landfills, it is highly biodegradable. This and other new sources of plastic may signal a shift in the way people think about packaging, said Walter Schmidt, a scientist with the Department of Agriculture’s Agricultural Research Service in Beltsville, Md., who works on making a different kind of plastic from feathers. "With foods, almost everyone understands half-life and shelf-life. No one expects milk in the fridge to be good three months after purchase." Yet we rarely think of packaging in the same way, said Schmidt. "Stuff floats around in the ocean [or] is mixed in landfills that stay there for generations. A far better solution is to make less mess in the first place and to have that material naturally recycle in a reasonable amount of time." Although feathers are known to be tough, he added, there are no archeological sites containing reservoirs of feathers, showing that they break down over time. The usefulness of any biopolymer, like the feather plastic, depends on the cost and versatility of the end product, said Schmidt, adding that when the price of oil increases, bio-alternatives become more attractive. As concerns over the environment and shortages of raw materials grow, creative thinking about waste products takes on greater importance. "Think of a Styrofoam coffee cup," said Schmidt. "It is used for maybe 10-15 minutes and discarded; one can dig up a Styrofoam cup from a landfill 200 years from now, wash it out, and reuse it. This is an example of a lousy design." A better design is an ice cream cone: "The container lasts a little longer than the ice cream in it." Although more work is needed to bring the new plastic into large-scale production, chicken feathers could soon be moving from the coop to the cup.